As the pros at Trenchless Replacement Specialists, there are 3 things we think you simply must know about trenchless technology. Yes, some may surprise you! Find out more below. You can skip the mess with our trenchless technology – find out more! Yes, you may have heard us say it before…our trenchless technology saves you from a mess! While that is definitely true, it’s important to consider what exactly this means. Not only does it mean no excavation or piles of dirt, but it means your home can remain clean and free of debris that result from traditional digging methods. This leaves your home and schedule to operate as normal – just like we’ve never even been there! Have you ever taken the time to consider all of the repair costs associated with a typical repair after an excavation to access a leak? It often turns into more of a remodel! Think about the drywall costs, paint costs, flooring costs, labor costs…oh my! Not to mention hiring the separate company to come and do the work. Save yourself the time, effort and money and choose trenchless technology. That’s right, we get it right the first time. When you have a leak, it may be hard for an ordinary plumber to actually track it down to see where it’s coming from. In fact, it may take them digging around a bit before they locate the source of the leak. Not with trenchless technology! Our underground camera allows us to find and diagnose the leak in no time! Let us help you utilize modern technology to save you from mess, repair costs, and unnecessary digging. 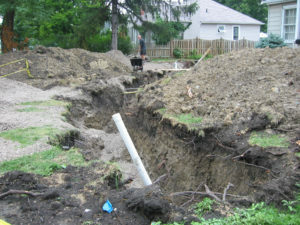 When you have an underground leak, think of us first. In fact, contact us today to see if you qualify for an underground camera inspection – normally a $300 value! Ditch the mess and call TRS today!